This article is about a seafaring occupation. For other uses, see Boatswain (disambiguation). The boatswain aboard a modern merchant ship stands cargo watch as freight is lowered into an open hatch. 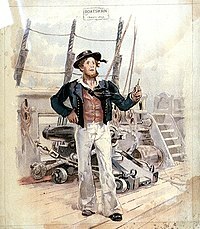 A boatswain (/ˈboʊsən/ BOH-sən, formerly and dialectally also /ˈboʊtsweɪn/ BOHT-swayn), bo's'n, bos'n, or bosun, also known as a Petty Officer or a qualified member of the deck department, is the seniormost rate of the deck department and is responsible for the components of a ship's hull. The boatswain supervises the other members of the ship's deck department, and typically is not a watchstander, except on vessels with small crews. Additional duties vary depending upon ship, crew, and circumstances. The word boatswain has been in the English language since approximately 1450. It is derived from late Old English batswegen, from bat (boat) concatenated with Old Norse sveinn (swain), meaning a young man, apprentice, a follower, retainer or servant. Directly translated to modern Norwegian it would be båtsvenn, while the actual crew title in Norwegian is båtsmann ("boats-man"). While the phonetic spelling bosun is reported as having been observed since 1868, this latter spelling was used in Shakespeare's The Tempest written in 1611, and as Bos'n in later editions. The rank of boatswain is the oldest rank in the Royal Navy, and its origins can be traced back to the year 1040. In that year, when five English ports began furnishing warships to King Edward the Confessor in exchange for certain privileges, they also furnished crews whose officers were the master, boatswain, carpenter and cook. Later these officers were "warranted" by the British Admiralty. They maintained and sailed the ships and were the standing officers of the navy. The boatswain was the officer responsible for the care of the rigging, cordage, anchors, sails, boats, flags and other stores. The Royal Navy's last official boatswain, Commander E W Andrew OBE, retired in 1990. The rank of cadet boatswain, in some schools, is the second highest rank in the combined cadet force naval section that a cadet can attain, below the rank of coxswain and above the rank of leading hand. It is equivalent to the rank of colour sergeant in the army and the royal marines cadets; it is sometimes an appointment for a senior petty officer to assist a coxswain. 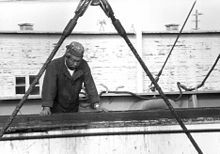 The boatswain works in a ship's deck department as the foreman of the unlicensed (crew members without a mate's licence) deck crew. Sometimes, the boatswain is also a third or fourth mate. A bosun must be highly skilled in all matters of marlinespike seamanship required for working on deck of a seagoing vessel. The bosun is distinguished from other able seamen by the supervisory roles: planning, scheduling, and assigning work. As deck crew foreman, the boatswain plans the day's work and assigns tasks to the deck crew. As work is completed, the boatswain checks on completed work for compliance with approved operating procedures. Outside the supervisory role, the boatswain regularly inspects the vessel and performs a variety of routine, skilled, and semi-skilled duties to maintain all areas of the ship not maintained by the engine department. These duties can include cleaning, painting, and maintaining the vessel's hull, superstructure and deck equipment as well as executing a formal preventive maintenance program. A boatswain's skills may include cargo rigging, winch operations, deck maintenance, working aloft, and other duties required during deck operations. The boatswain is well versed in the care and handling of lines, and has knowledge of knots, hitches, bends, whipping, and splices as needed to perform tasks such as mooring a vessel. The boatswain typically operates the ship's windlasses when letting go and heaving up anchors. Moreover, a boatswain may be called upon to lead firefighting efforts or other emergency procedures encountered on board. Effective boatswains are able to integrate their seafarer skills into supervising and communicating with members of deck crew with often diverse backgrounds. Originally, on board sailing ships the boatswain was in charge of a ship's anchors, cordage, colours, deck crew and the ship's boats. The boatswain would also be in charge of the rigging while the ship was in dock. The boatswain's technical tasks were modernised with the advent of steam engines and subsequent mechanisation. A number of boatswains and naval boatswains mates have achieved fame. Reuben James and William Wiley are famous for their heroism in the Barbary Wars and are namesakes of the ships USS Reuben James and USS Wiley. Medal of Honor recipients Francis P. Hammerberg and George Robert Cholister were U.S. Navy boatswain's mates, as was Navy Cross recipient Stephen Bass. Victoria Cross recipients John Sheppard, John Sullivan, Henry Curtis, and John Harrison were Royal Navy boatswain's mates. There are also a handful of boatswains and boatswain's mates in literature. The boatswain in William Shakespeare's The Tempest is a central character in the opening scene, which takes place aboard a ship at sea, and appears again briefly in the final scene. Typhoon by Joseph Conrad has a nameless boatswain who tells Captain MacWhirr of a "lump" of men going overboard during the peak of the storm. Also, the character Bill Bobstay in Gilbert and Sullivan's musical comedy H.M.S. Pinafore is alternatively referred to as a "bos'un" and a "boatswain's mate." Another boatswain from literature is Smee from Peter Pan. Lord Byron had a Newfoundland dog named Boatswain. Byron wrote the famous poem "Epitaph to a Dog" and had a monument made for him at Newstead Abbey. Quartermaster is the highest rank in the Sea Scouts, BSA, an older youth (13-21) co-ed programme. The youth can also elect a youth leader, giving that youth the title "boatswain". A Boatswain (Bootsman) is in the Netherlands the patrol leader of a Sea Scout patrol (Bak), in Flanders it is the assistant patrol leader of a Sea Scout patrol (Kwartier). Look up boatswain in Wiktionary, the free dictionary. This article incorporates text from public-domain sources, including the Naval Historical Center and/or other U.S. Government websites. For specific sources of text, see notes. ^ "Boatswain". Online Etymology Dictionary. Retrieved 2007-05-25. ^ a b "HMS Victory". royalnavy.mod.uk. Archived from the original on 2007-01-13. Retrieved 2007-05-26. ^ a b Naval Historical Center (2005-07-20). "Why is the Colonel Called "Kernal"? The Origin of the Ranks and Rank Insignia Now Used by the United States Armed Forces". United States Navy. Archived from the original on 1998-07-03. Retrieved 2007-05-26. ^ a b Chisholm, Hugh, ed. (1911). "Boatswain" . Encyclopædia Britannica. 4 (11th ed.). Cambridge University Press. p. 100. ^ "Ship's Namesake". USS Reuben James Official Website. Archived from the original on 2007-05-09. Retrieved 2007-05-26. ^ Naval Historical Center (1981). "Wiley". Dictionary of American Naval Fighting Ships. United States Navy. Archived from the original on 2007-11-14. Retrieved 2007-05-26. ^ Naval Historical Center (1981). "Hammerberg". Dictionary of American Naval Fighting Ships. United States Navy. Archived from the original on 2010-12-07. Retrieved 2007-05-26. ^ Naval Historical Center (1997). "Navy Medal of Honor: Interim Period 1920-1940". Dictionary of American Naval Fighting Ships. United States Navy. Archived from the original on 1997-07-09. Retrieved 2007-05-26. ^ "CPO Stephen Bass, U.S.N." LegionOfValor.com. Archived from the original on 2012-09-07. Retrieved 2007-05-26. ^ See quote from "The Complete Annotated Gilbert & Sullivan" at . ^ See quote from S.W. Gilbert in "The story of the H.M.S. Pinafore" at . ^ J M Barrie (December 27, 1904). "Act II: The Never Land". Peter Pan or The Boy Who Would Not Grow Up. Retrieved 2007-05-27 – via Project Gutenberg. ^ a b Clinton, George (1828). Memoirs of the Life and Writings of Lord Byron. London: James Robbins and Company. p. 8. Retrieved 2007-05-27. Bureau of Labor Statistics (U.S.A.) (2007). "Water Transportation Occupations" (PDF). Occupational Outlook Handbook. Government Printing Office. Archived from the original (PDF) on 2000-08-31. Retrieved 2007-04-23. Oregon University System (2004). "Classification Number: 4512 Boatswain". Position Descriptions. Oregon University System. Archived from the original on 2008-03-27. Retrieved 2008-04-28. United States Naval Institute (1996) . The Bluejackets' Manual (21st ed.). Annapolis, MD: United States Naval Institute. ISBN 1-55750-050-9. Woods Hole Oceanographic Institution (2003). "Boatswain". Position Descriptions. Woods Hole Oceanographic Institution. Archived from the original on 2008-02-27. Retrieved 2008-04-28.
International Labour Organization (5 December 2000). "Seaman, Merchant Marine". International Hazard Datasheets on Occupation. Retrieved 26 May 2007.